Owing to the civil engineering work being carried out at the Zolder track, there’s a slight change in the testing arrangements prior to the start of the Belcar season. The ‘Belcar Shakedown’ on March 30 now takes place at Spa (not Zolder) while one week later, immediately before the opening weekend of the series; the ‘Belcar Launch’ will be held on the new Zolder track. A Ferrari 550 or a Corvette then, for Kumpen / Longin? Johan Van Loo, who won the Philip Verellen Junior Trophy in 2005, has signed up with GS Motorsport, the team of ‘patron’ Georg Severich. Van Loo will drive the second Porsche 996 GT3 Supercup 2005 in class 3. Neyens and Steinberg will drive the other Porsche 996 Supercup. Van Loo comes from First Motorsport where he made his debut last year, together with Dirk van Rompuy. The team finished third in GTB and third in the Welcome Trophy. Who will partner Johan Van Loo within GS Motorsport in 2006 is as yet unknown. S&P Racing, the team managed by Fred Grönitz, is keen to come back to Belcar in 2006. Steve Metior and Patrick Ceusters will again race the Porsche 996 GT3-R in class 2. Fred Grönitz: “We’re happy with the progression of Steve and Patrick in the ex-Lamot Porsche 996. The car is still competitive and we now have an RS-engine and RSR-suspension. By the end of last season, we proved to be a good contender in GTB. 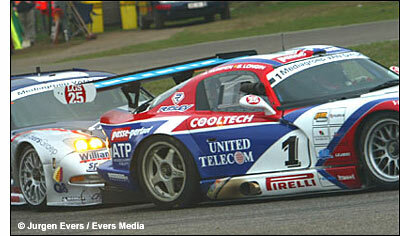 Patrick, together with Henk Haane, finished a good 3rd in class in the final Belcar race of 2005. The spirit of the team for next season is already very good. It will be the fifth season with Steve and Patrick together and this is only possible if everything is ok within a team. If Steve, who has a busy professional life, is unable to race, Karl Jacobs will replace him. Gabriël Racing carries on with the duo Bouillon / Tavernier but the team recently took on a new name: McDonald’s Racing Team. The squad will enter the Porsche 996 Biturbo again (class 1). Luc Gabriël has also bought a Porsche GT3 Supercup to race in class 3. Philippe Leybaert, a former Clio and Yaris cup driver, could be in line for a seat. Toon Van De Haterd returns to Belcar. He will enter the Marcos Mantis already seen in 2003 in Eurotech colours. In 2003, he and Hans De Groot finished seventh in GT and third in GTA after a consistent season. Van De Haterd asked Autosport Centrum Schaijk (ACS), formerly known as Promotech Motorsport, to rebuild the 5-litre V8 Ford powered Mantis. The team is still looking for a second, fast driver, as Hans de Groot will only start in the 24 hours owing to his business commitments. The car will, very likely, start in class 2. With a good power to weight ratio (570 bhp and 1100 kilos) this could well be a surprise. And last but not least, Cor Euser plans a comeback to the Zolder 24 hours with his mighty Marcos LM 600. His plans to develop a BMW 6-series seem to be on hold, as developing the car is not so easy, certainly as BMW Motorsport is not supporting the project. If ever the BMW comes to track, Cor wants it to be faster than the Marcos LM600. As already reported, Eurotech will also be running a big Marcos, for none other than Marc Goossens and team owner Wim Noorman.